AAPG Annual Convention and Exhibition | Geoconferences (WA) Inc. I am grateful that the Geoconferences (WA) Inc. awarded me the JH Lord Travel Grant, which helps cover part of the travel expenses of attending the 100th Anniversary AAPG ACE in Houston, TX, USA (2-5 April 2017). It is the largest conference with dedicated focuses on technical areas of the upstream of the oil industry. The AAPG ACE brings together petroleum geologists all over the world to share, learn, and innovate. 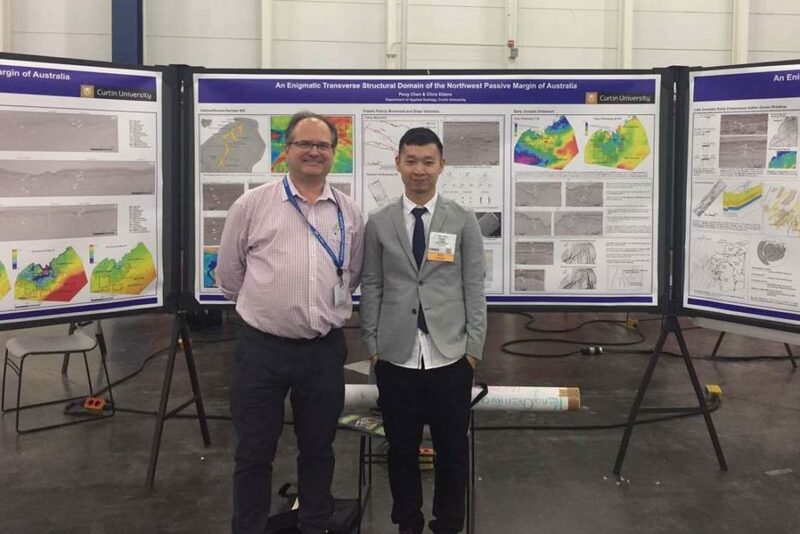 My poster titled An enigmatic transverse structural domain of the North West Shelf of Australia was presented in the Theme: Structure/Geomechanics: Crustal Architecture & Rifting on 3 April, 2017. The presentation summarised some of the findings of my PhD project. Specifically, I investigated the structural architecture and basin formation history in the central area of the North West Shelf (Roebuck Basin and the adjacent parts of the North Carnarvon Basin). The results indicate an NW-SE to N-S structural domain in the area, which contradicts the conception that the North West Shelf was predominantly affected by NE-SW structures. The tectonostratigraphic background, Basin subdivision and framework, key evolutionary stages (Paleozoic, Triassic, Early Jurassic, Late Jurassic-Early Cretaceous) and fault linkages, segmentation, inheritance and reactivation are included in the presentation. They help us understand the development of the NW-SE to N-S structural domain and basin formation history. I have received a great deal of feedback from other researchers, which will be valuable for the advance of my PhD research. Also, attending other poster and oral sessions in various topics has broadened my scientific view. Meeting with industry representative has widened my knowledge in the oil industry. Again, I extend my gratitude to JH Lord Travel Grant to fund my attendance to AAPG ACE.